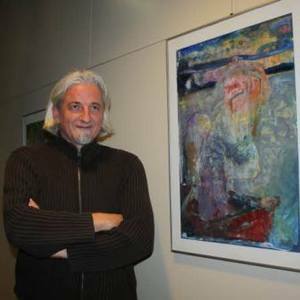 Bato Bostandzic was born in Capljina, a small Mediterranean town in Bosnia and Herzegovina, as a son of a well-known local artist and art professor. Art became his life, and he has lived with the scent of oil paint and canvas all his life. He got his motivation for painting and an early art education from his father. Bato got his first international art award in 1983, and other rewards and recognitions followed. He has actively worked with oil on canvas for more than twenty five years, and he has started working with clay about ten years ago. Bato has exhibited his work in Europe and California. He has participated in many international juried art shows and workshops in Germany, Bosnia-Herzegovina, and Montenegro. More importantly, he has proven to be an artist with a big heart since he has participated for many years in annual charity art shows, and he has organized pottery workshops for orphaned children for The International Charity “Duga” in Kulen Vakuf, Bosnia-Herzegovina. From 1998 to 2007, he lived and worked in Orange County, CA. He co-owned a small studio gallery with one on his fellow artists in Santa Ana Artist Village and participated in monthly art walks. From 2007 to 2014, Bato lived in Sarajevo, the capital of Bosnia-Herzegovina, where he worked as an art instructor at Quality Schools International. He has participated in many individual and group shows throughout Europe. He has organized pottery workshops for kids and adults. In August 2014, he moved back to CA, this time to Los Gatos and was a member of Los Gatos Artists Association. He owned Art of Mine, a studio gallery in Capitola. Currently, Bato lives and works in Davis, CA. An active member of ULUBIH (Association of Artists of Bosnia and Herzegovina) since 2009, and a member of Yolo Arts since August 2016.